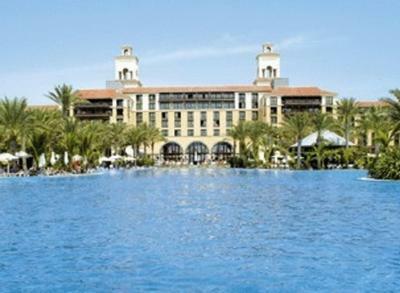 Lopesan Costa Meloneras Resort Spa & Casino Canary Islands Hotel in Maspalomas Gran Canaria. This Hotel by the beach in Canary Islands on the Coast of Spain, has a swimming pool, is close to the beach. Prices from 106.4 EUR. Welcome to the Lopesan Costa Meloneras Resort Spa & Casino Canary Islands Hotel.Lopesan Costa Meloneras Resort Spa & Casino is set on the south coast of Gran Canarias, just 300 metres from Maspalomas Beach. It has a large swimming pool complex and tropical gardens. For more on this Hotel by the beach in Canary Islands on the Coast of Spain please click on the availability buttons above and below. The Lopesan Costa Meloneras Resort Spa & Casino provides excellent Hotel in Maspalomas Gran Canaria, Canary Islands, on the Coast of Spain. The address is Mar Mediterraneo, 1, Maspalomas , 35000.